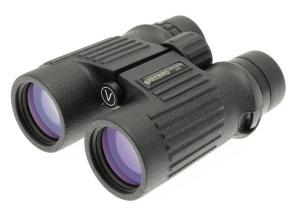 The Visionary Freebird 8x42 binoculars feature exceptional quality optics in a medium compact style. Aimed at users that want the performance of full size binoculars in a more compact body. The 8x magnification provides a good field of view with a very bright image which is beneficial when tracking moving objects. The style of the Freebird range gives the performance of a traditional full size binocular in a more streamlined lighter weight body. The Visionary Freebird 8x42 is packed full of features, with a specification that rivals many significantly more expensive models. Designed with the outdoors in mind the binoculars are fully waterproof and nitrogen filled combined with a robust rubber armoured body. BAK4 prisms ensure a brighter by maximising light transmission. Phase coated optics with full multi-coating improves the image quality even further and makes this range a class above models in a similar price bracket. Efficient use of the light gathered is particularly important at high magnifications or when using smaller front lenses, as images appear darker.